Throughout the United States over 250 million used tires are discarded into dumps and landfills. Our Recycled Treads Collection Pots and Containers address this issue head-on. Each vessel is formed from a raw rubber from discarded tires that were stripped of its tread and steel belts. Throughout the United States over 250 million used tires are discarded into dumps and landfills. Our Recycled Treads Collection Pots and Containers address this issue head-on. Each vessel is formed from a raw rubber from discarded tires that were stripped of its tread and steel belts. They are cut and sewn by hand. All of the stitching uses a durable nylon thread, and the major joints are all reinforced using exposed nuts and bolts. The result is a wonderful blend of industrial materials and ancient forms. 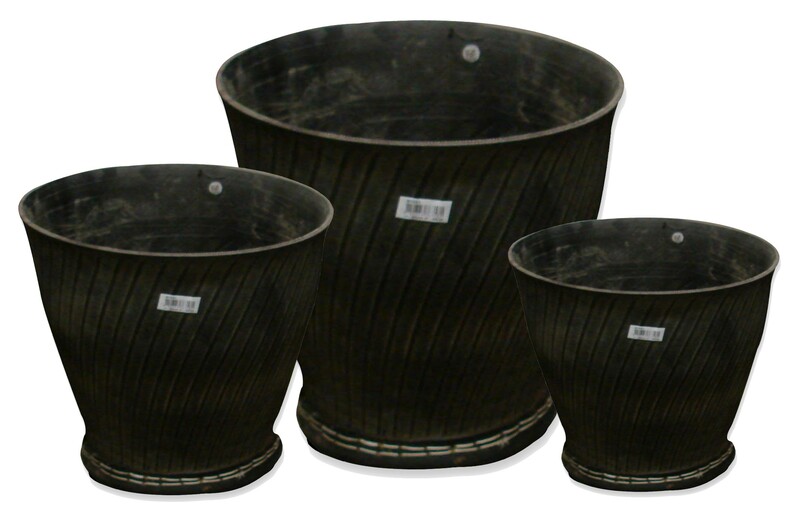 These sturdy vessels can be used for a wide variety of functions, ranging from storage to to planting. * Will NOT Crack in the heat!